Sifnos wedding: exclusivity for the selected few! Sifnos may not come first to our minds when talking about Cyclades, as may Mykonos or Santorini, but it is the island of harmony and balance preferred by those few who know where to turn to avoid the crammed cosmopolitan destinations. Sifnos is an island easily accessible by boat and once you get there you are overwhelmed by the peacefulness of the landscape. It is a Cycladic destination with picturesque scenery composed of whitewashed houses and clear blue waters. Having your wedding in Sifnos is the perfect choice for couples that are looking for a traditional Greek touch to their special day. Seven Martyrs church surrounded by the Aegean blue, on the top of a hill, contrasting the black rocky landscape with its bright white colour would be a great choice to hold your wedding ceremony. The perfect Cycladic scenery for the perfect Sifnos wedding! Enjoy a night walk in the streets of Apollonia where all activity of the island takes place, with lots of restaurants, cosy cafes, bars and traditional white houses beautifully surrounded by bougainvilleas. Take time to explore the traditional gastronomic treasures Sifnos has to offer, with the popular chickpea soup prepared in ceramic pots and mastelo, the slow cooked pork or lamp in clay pots locally crafted, which you could definitely incorporate in your wedding menu for a Greek flavored result. Sifnos wedding in gastronomic terms for you and your loved ones! 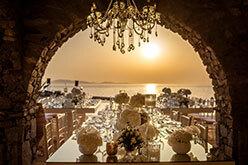 Have your wedding in the island of Sifnos and allow the bright light of the golden sun to enlighten your special day while we create the most romantic and tailor-made setting. Let us make your dream wedding in Sifnos come true !